All of us here at Sharpeye Surfboard would like to officially welcome an exciting young talent, Dane Henry. Dane jumped on board the SE ship last year and has been a dominating force in the U14's devision. 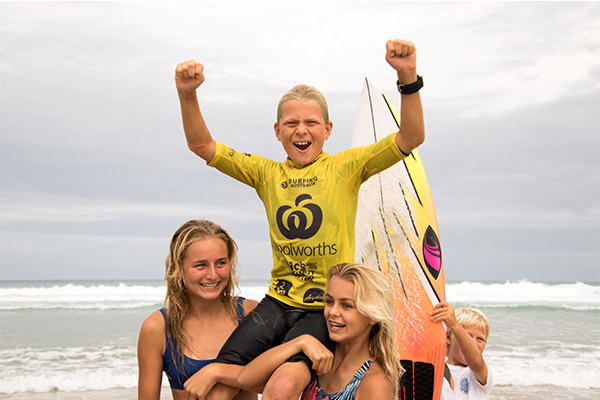 Just recently Dane took out the Woolworths Surfer Grom Comp presented by Pic’s Peanut Butter on the Gold Coast. Competitors were greeted with glassy and clean 3-4ft waves from a lingering East / Northeast swell, which once again saw the Fingal Spit pumping all day after the event kicked off at 7:30 am. Dane dominated in the under 14 boys division, defeating Ty Richardson, Xavier Bryce and Dom Thomas respectively in the final. Henry scored a 7.93 (out of a possible 10.00), backed up with a 6.17 for a combined heat total of 14.10 to take the lead in the final four minutes of the heat – and managed to keep his lead until the final siren. Henry was ecstatic as he was chaired up the beach by friends and family. "I'm super happy with my result today," said Henry. "It's my first big win in a while so it feels great to be back on the podium again. Thanks to everyone involved, I'm stoked." Welcome Dane, we're excited to have you!